The beauty of the cornea is in its clarity. This avascular, thin, anterior-most tissue of the eye serves functional and structural roles. Functionally it allows light/image entry and begins the focusing process of the image. Without clarity of the cornea image distortion occurs and vision becomes compromised. Diseases/traumatic processes that put the clarity of the cornea at risk must be halted early to prevent the onset of disruptive wound healing steps. The goals of treating corneal disease are to restore both functional and structural roles of the cornea. 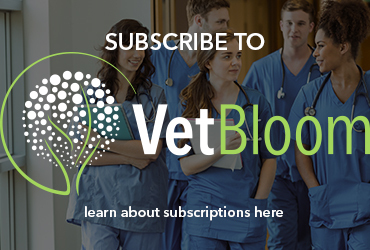 Rapid wound healing of superficial ulcerations without vascularization is one example. Another is instituting aggressive treatment to resolve infectious or inflammatory disease as to prevent the onset of scar tissue or stromal thinning. Corneal disease resulting in defects within the corneal stroma are a common part of ophthalmic practice. The loss of the structural stroma is worrisome as it raises the risk of rupture (Fig. 1). When this occurs procedural options should embrace the goals of structure and clarity as much as possible. 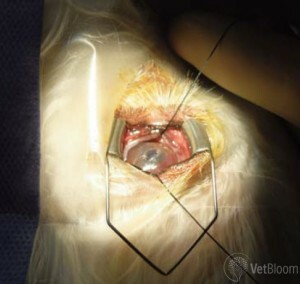 Various corneal grafting techniques are available; however when a central visual field lesion occurs, the option of corneal transplantation must be considered. The most common type of corneal restructuring graft is the conjunctival pedicle/advancement flap. 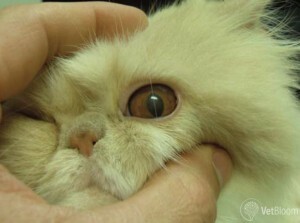 The techniques are suited primarily for restoring the corneal strength (marginal at best though), but is a very poor optical choice. These grafts rarely result in clarity (Fig. 2). Their value however lies in the rapid vascular supply to a degenerating wound that either has perforated or is at high risk of rupture. In wounds that are stable and non-progressive other techniques should be considered. 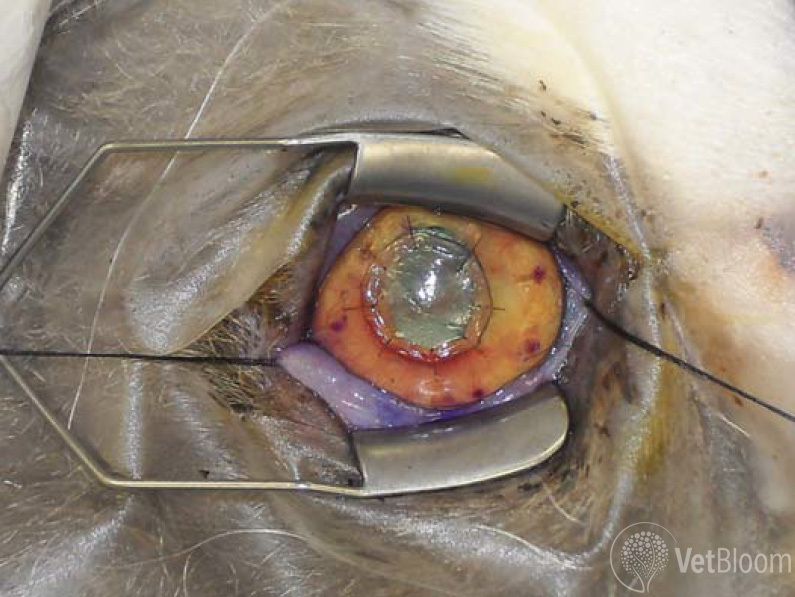 A variation of the conjunctival graft that allows the surgeon to bring optical clarity and reconstructive strength to central corneal lesions is the corneo-conjunctival transposition (CCT). 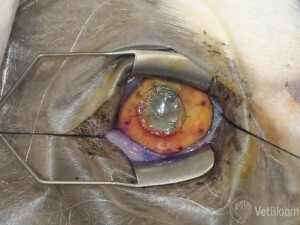 This procedure uses the disease free peripheral cornea for reconstruction of the central wound. 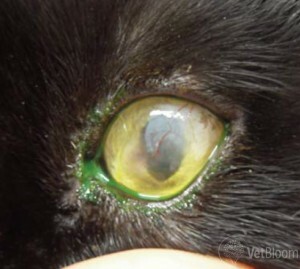 The resulting peripheral wound is then filled in with limbal and conjunctival tissue. Rejection of the graft is very uncommon since it is autogenous tissue. Additionally, autogenous partial thickness grafting is used when a region of significant thinning is present centrally and peripheral clear is available. This ultimately results in two partial thickness defects within the same cornea. Again the advantage of the procedure is that of acceptance of autogenous transferred tissue, clarity and improved strength (Figs. 3 and 4). If the disease or trauma results in large (wide and deep) defects in the corneal stroma, use of autogenous tissue is not an option. 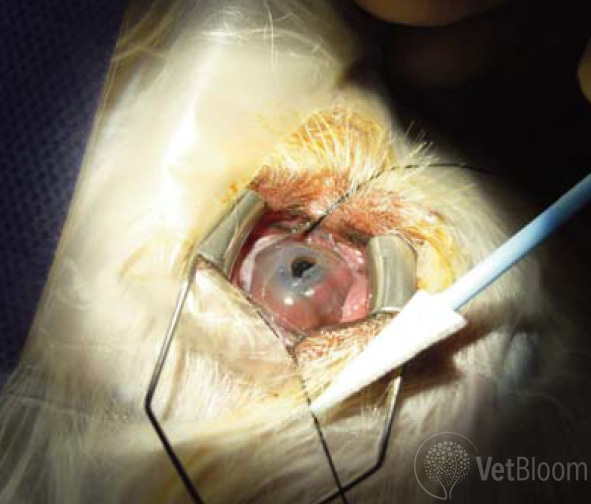 Corneal transplants from like species becomes an excellent alternative. 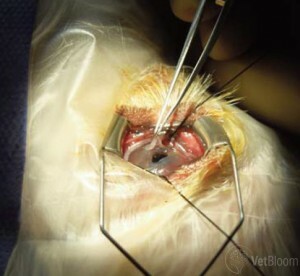 Most commonly in veterinary surgery partial thickness grafting techniques are available and are limited only by the availability of donor tissue. Donor corneal tissue comes from animals who have passed on and whose guardians have given permission for collection. The donors have been screened to ensure prior corneal disease was not present. Donations are greatly appreciated gifts for patients who are in need. Currently transplanted corneal tissue is used for reconstruction of corneal sequestra (Fig. 5), descemetoceles (Fig. 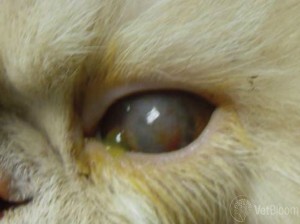 1), deep corneal defects, and severe central corneal scarring. 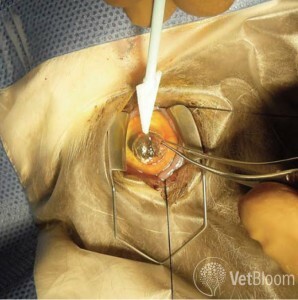 For patients with descemetoceles or epithelialized deep corneal defects (severe stromal thinning), the use of partial thickness tissue transplants is ideal. These partial thickness grafts are especially desired when the defects involve the cornea within the visual axis. Full thickness techniques are rarely used in veterinary surgery. The technique for a lamellar keratoplasty involves removal of the anterior portion of the donor corneal stroma and epithelium. The thickness of the donor graft depends fully on the depth of the recipient’s wound. Therefore deep anterior lamellar keratoplasty involves dissection to the level of, but does not include) Descemet’s membrane. Lamellar keratoplasties are for less deep defects. Prior to the transfer, the recipient bed was prepared and measurements taken to ensure proper fit. The donor tissue is then transferred onto the anesthetized patient’s cornea. 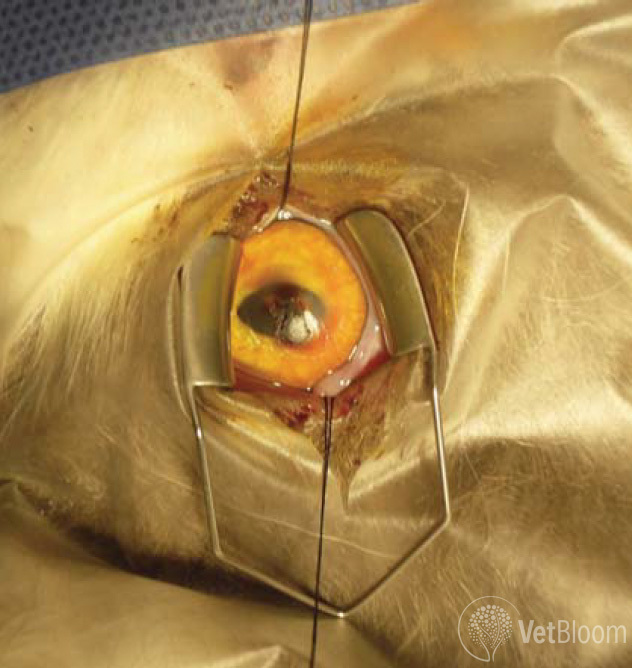 The corneal graft is sutured in position with 9-0 Ethilon and less commonly with absorbable 9-0 Vicryl to ensure stability during recovery (Figs. 6 and 7). Post operative care for the transplant patient is no more complicated than that of other corneal procedures. Topical antibiotics and oral pain medications are commonly dispensed. The initial goal is to ensure the graft is not at risk of infection. Epithelialization of the graft helps to keep surface bacterial contamination to a minimum. The next phase of recovery is to limit the degree of vascularization in order to maintain the clarity of the graft (Fig. 8). 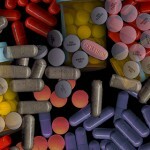 This may require longer term medication, but life time medications are rare. Ultimately the clarity of the graft can be excellent and supersede the results of vascularized grafts (Fig. 9). Fig. 2: Persistent vascularization following conjunctival grafting.